The classification has been compiled over some 30 years and many Categories, Types, Sub-types and Variations have been added since the Archive came into being. It currently includes some 772 motifs, although a small number of these motifs relate to the fourth century only. The classification is by shape, to which have been added other special categories, such as animal and jewellery stamps. Every effort has been made to keep the whole as logical as possible, but in some instances this has proved to be impossible. I am in the process of reviewing the entire Classification and removing some of the most obvious inconsistencies. The classification was first published in BAR 92 (1981), but it is hoped to publish an up-to-date version giving a complete description of all motifs, in the foreseeable future. 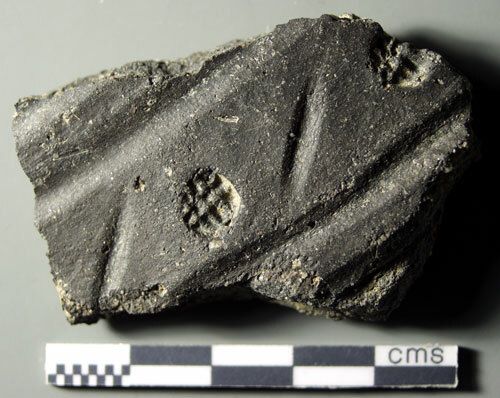 As a result of using the classification, we have found that it can be used to code any pot-stamp from Iron Age to Post-Medieval periods. It also provides a shorthand method of referring to individual stamps, which eliminates a long-winded and detailed description. Categories define the basic shape of the motif; Types provide a first breakdown; Sub-types define it further and Variations provide the final differentiation. In certain Variations, there are so many stamps that Sub-variations have been introduced to subdivide the motifs further. Grid stamps are classified by how many negative squares they have in each direction. These include the Sub-types A 3a, C 2a, D 2a, E 2a and F 2a. As stated above, the Classification grew organically (and not necessarily logically). As part of the exercise of putting it online, certain Type numbers have been revised in order to provide a more consistent hierarchy. More recently and in particular, the R (Rouletting) and M (Jewellery & Miscellaneous Metal) Categories have been completely revised and major changes have been made to the A 5a and A 5d (various types of rosette motifs). In all cases, if your classifications have been altered, please contact the AASPS to have them updated as a free service.